[Rathdrum, Idaho, USA] – Warm boots, a good winter coat, a passport and travel visa – and Russian language lessons. Isaac Sanders is making a list of what he needs in the next few weeks before he departs for Moscow to begin the biggest, most nerve-wracking adventure of his life. 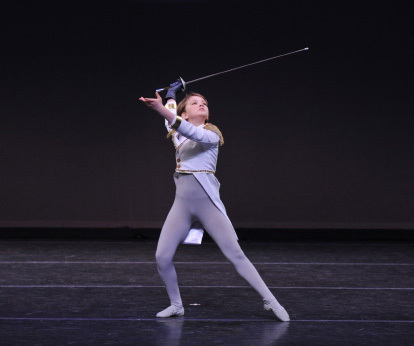 Sanders, 14, has been invited to study at the prestigious Bolshoi Ballet Academy. And if you haven’t heard of that, think Juilliard or the Royal College of Music, only lots more snow. The terse invitation came by email earlier this month. His mother, Emily, opened it first and let out a scream. Then he read it. “I was just stunned for the next couple of hours,” Sanders said. “I mean, I just couldn’t believe it.” He celebrated by dancing around the living room. Then he took a class at a ballet studio in southeastern Idaho [Brindusa-Moore Ballet Academy], where the family lived until about two years ago. “It was super-challenging, super-difficult, but I loved it,” he said. He still spends most of his time in Pocatello, returning to Rathdrum every few weeks to visit his parents, four younger sisters and baby brother. One of his instructors, academy co-founder Sergiu Brindusa, called Sanders a genuine prodigy exhibiting natural ease and outstanding coordination. “He really is meant to go far in life, and we’ve always known that,” Brindusa said. This is their first student to be invited to such a prominent institution, and Brindusa said he wouldn’t be surprised if the Bolshoi invited Sanders to stay on after the first year. “Our whole premise with his mom and dad was that we said this kid is so talented that he has to go somewhere. From day one we said that,” Brindusa said. 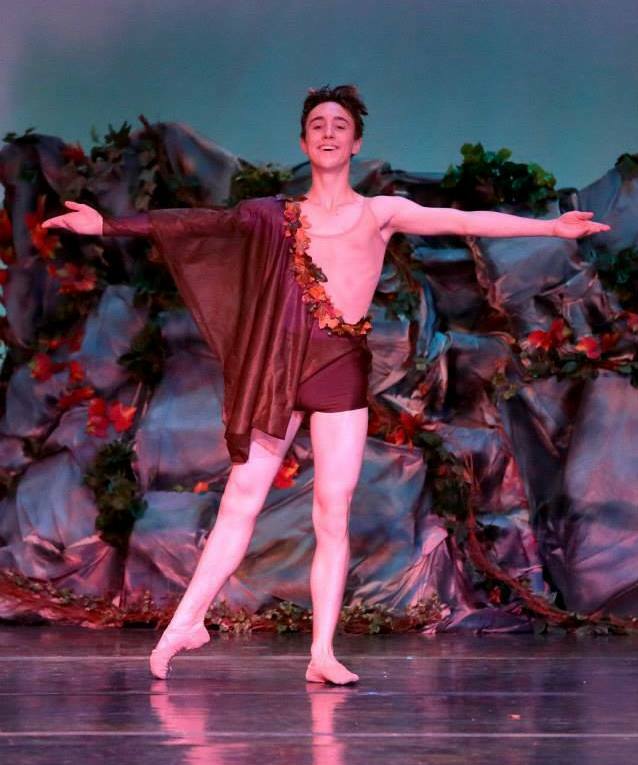 Sanders kept busy this year with national competitions in New York, San Francisco and Orlando, Fla., and he recently completed the six-week Bolshoi Academy Summer Intensive in Connecticut – recruiting grounds for the Moscow academy. Usually just one boy and one girl are tapped from there and from a sister program in New York to study in Moscow each year. The summer intensive is aptly named. Sanders started each day early with stretching and strengthening routines followed by ballet classes, then character and acting classes in the afternoon, and finally Russian language and ballet history courses in the evening. Most of his training has been in the Russian method of ballet, which is an advantage. But he won’t have the assistance of translators and needs to learn Russian quickly. “I just want to dive in and get it all,” said Sanders, who intends to dance professionally but is completely open to where he ends up. His parents are feeling a range of emotions over all this. Sanders will leave in October and return next June. Issac is the oldest of six children. As you can imagine, tuition, room and board, travel, and insurance is very expensive–far beyond the reach of Isaac and his family. Isaac, therefore, is asking for help. If you would like to make a donation, Isaac and his parents have established a website at www.isaacsanders.org. Isaac’s facebook page can be found at https://www.facebook.com/helpisaactaketheleap. Isaac’s mother wrote on her blog: I think most teens think the world does (or, at least, should) revolve around them. Unfortunately, in Isaac’s case, he’s mostly right (except for the literal earth revolving around him part). You see, we are frantically scrambling to raise enough money for him to attend the Bolshoi Ballet Academy in Moscow, Russia. We are talking to everyone, presenting to groups, having a spaghetti feed/performance, utilizing the internet and its many wonders and even manning a booth at a local street fair. We have many incredible friends and generous sponsors, however we are still only about 1/4 of the way there. An acquaintance recently took Isaac for the day and, together with other volunteers, created these videos. I know there are more to come, but I thought these were so amazing, I had to share them with my readers. Washington — In the midst of this year’s sweltering Moscow summer, and notwithstanding the smoke from nearby peat fires, 10 young American ballet students were busy perfecting different dance positions at the Moscow State Academy of Choreography. Now back home from the Bolshoi Ballet Academy Summer Intensive program organized by the Russian American Foundation (RAF) and the renowned Bolshoi Ballet Academy, they ponder their new understanding not only of various forms of dance but also of the Russian people and Russian culture. The Bolshoi initiative had received funding from a U.S. Department of State scholarship program providing American secondary school students with the opportunity to study less commonly taught languages, such as Russian, in the countries where they are actually spoken. Wiese told America.gov she is now more committed than ever to continue her Russian-language studies. “I think I turned into more of a ‘bunhead’ [female ballet dancer] there than before I came. I truly think this was my best summer in my life so far,” said student dancer Mable Yiu. Many of the American students in the Bolshoi Ballet Academy program had received Russian ballet training in the United States and were excited to be able to visit the country with one of the oldest and most prestigious ballet academies. “My training is Russian, therefore it interested me as a culture,” Micah Garton explained. “Since being here, I have a whole new understanding about Russia,” he said. Currently in its first year, the RAF’s Bolshoi Ballet Academy program is different from other ballet programs in that it puts major emphasis on language and culture. The all-expenses-paid trip to Moscow from July 17 to August 28 included about 2.5 hours of ballet classes and 2.5 hours of Russian language classes every day. No previous knowledge of Russian was required. “I never thought to have learned so much Russian as I did in six weeks. Everyone I have met — from the academy students in my ballet class, to the ladies who make our meals in the cafeteria, to the cashiers at the metro station have — all contributed to my experience here,” said Wiese. The opportunity to practice alongside Russian ballet students not only gave the Americans the chance to practice Russian, but also inspired them to pursue their passion for ballet. “The other students that were there that attend the academy year-round were also a big inspiration,” said Yiu. “Whenever it wasn’t our turn to dance, we would drool at some of them in awe of how amazing they were! It was also fun trying to communicate with them in Russian, trying to find out how old they were, and we even got to ‘friend’ some on Facebook,” she added. 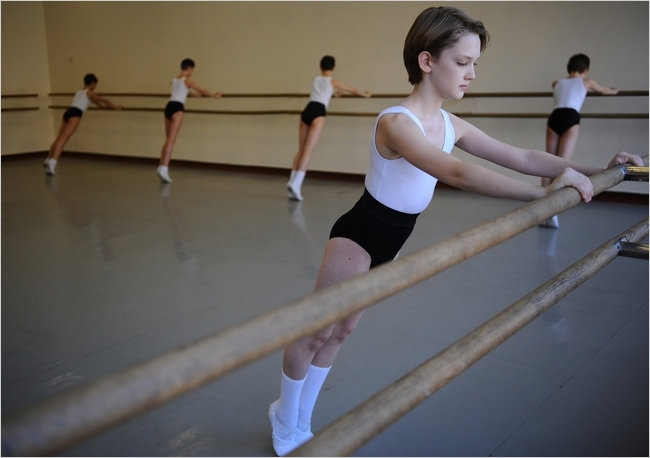 Ballet classes, conducted by Bolshoi Ballet Academy teachers, were taught in Russian so that the American students could improve their language skills and have a complete experience in a Russian ballet class. The courses included classical dance, ballet gymnastics and folk, scenic and historical dances, all of which are standard components of ballet choreography. The American students said that the training they received helped them improve their technique tremendously. “The way I think now is a lot more about how to get the best and most technical line I can achieve. It isn’t about getting your leg to your head, it is about doing it correctly, and with time and effort you will be able to achieve perfection,” Ives said. “I improved 100-fold while being in Moscow,” he added. Although students lived in the academy dorms, on the weekends they would join Russian host families who have teenage children of similar ages. “They got to know what Russian youth life is through being with them on the weekends,” said RAF Vice President Rina Kirshner. The program’s cultural component included trips to many Moscow sites, including a private tour of the Tsereteli Art Gallery, located in a beautiful neoclassical building near the center of the city. Students also visited places such as the Stanislavski Moscow Academic Music Theater, where they saw a performance of Don Quixote, a ballet choreographed by Marius Petipa that first premiered in Russia at the end of the 19th century. More information about the Bolshoi Ballet Academy Summer Intensive can be found on its website. MOSCOW — The curtain rose on the Bolshoi Ballet’s revival of “Esmeralda,” and soon boys and girls dressed in Renaissance costumes took to the stage, pairing off in a spirited dance that they had learned in the Bolshoi’s own hothouse of an academy. They were the future of Russian ballet, heirs to centuries of glorious Russian tradition, an elite few who had been chosen from across Russia. Except, that is, for the one from Montana. There he was, a boy named Julian MacKay, who not long ago was gathering eggs from a flock of chickens behind his home in Bozeman, who had turned his life upside down by moving to this strange land with its even stranger language to pursue his dream. 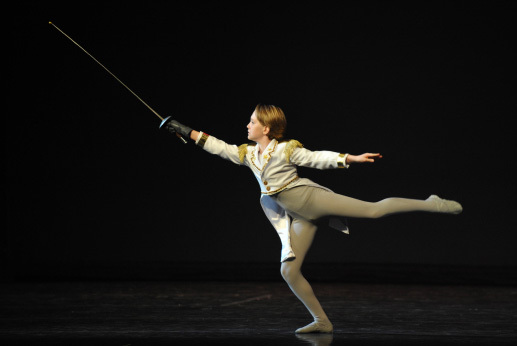 All of 12 years old, he was having his Bolshoi debut in Moscow. Leaving the stage, he glanced at the audience. “That was when it caught up with me that I was right there, an American at the Bolshoi,” he said. The ballet pipeline used to run mainly in one direction. Russians — Baryshnikov and Balanchine, Godunov and Nureyev — went (or defected) to the West. But now a handful of young Americans are venturing the other way, apprenticing themselves at the academy here, which has long been the sweat-and-tears training ground for many of Russia’s ballet greats. Julian is among the youngest, but there are a few others, including a Texan, Joy Womack, who arrived at 15 on her own last fall. 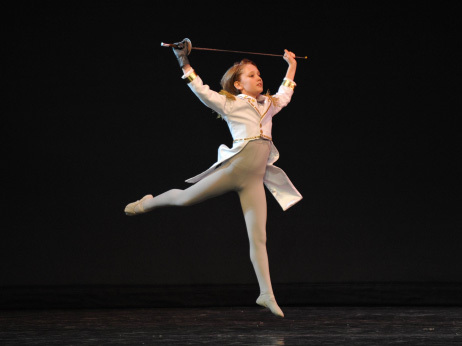 She has also appeared on the Bolshoi stage and has become one of the best students in her class, her teachers said. For the Americans, both the culture shock and the rewards can be profound. The school, formally called the Moscow State Academy of Choreography, was established in 1773, and while it accepts foreign students, it is not about to change its ways. And so there has been no hand holding for Julian and Joy, no Russian-language interpreters or preparatory sessions. They were thrown in with students who had years of immersion in exacting Russian dance schools. Both Julian and Joy had experience in prominent American dance academies, but at first the Bolshoi instructors seemed to greet the two Americans with frowns. Their muscles were not properly developed. Their technique was sloppy. And though it was difficult to see extra pounds, they needed not only to lose weight, but also to lose it in certain places. The first months were all the more challenging because they spoke little if any Russian when they started. Yet the two said that despite the pressure and the physical toll — Joy often wakes up unusually sore even for a dancer — this is where they yearned to be. They came to Moscow as part of a nascent program sponsored by the Russian American Foundation, a nonprofit organization in Manhattan that promotes cultural ties between the countries. In recent years the foundation has run a summer session in the United States at which American children work with Bolshoi instructors. The academy’s director, Marina Leonova, has shown a personal interest in expanding its ties with the United States. Last summer the academy invited a few who attended the summer session, including Julian and Joy, to enroll as full-time students, said Rina Kirshner, the foundation’s vice president. One of them, a 13-year-old girl, dropped out at Christmas after her parents decided that the atmosphere was too stressful for her to be here on her own. The academy is in a Soviet-era building that is drab but has a mystique. Walls are lined with photos of illustrious graduates. Pianists accompany the classes, and their music drifts through the halls. Outside the second-floor studios children warm up by contorting their limbs in unnatural ways. The younger ones bow and curtsy to guests. This is a government institution with about 750 full-time students who range in age from 10 to 18. Among them are about 90 foreigners from numerous countries, including Japan, Britain, Finland and Greece. East Asians in particular are heavily represented. Russians study free; foreigners each paid $18,000 in tuition this year. It’s a struggle for both Julian’s and Joy’s families. A visit to one of Julian’s dance classes offered a glimpse at the intensity of his day. His teacher, Olga Voynarovskaya, rattled off commands in Russian to a group of 10 or so boys in one of the mirrored studios. She lectured. She cajoled. She grimaced, wagged her finger and shook her head. She even slapped their limbs into place. “Misha, stand up,” she said. “Ilya, don’t annoy me. Pull your ribs in. Are you sleeping? You look like you are asleep. Come on!” At times she joked — and even praised. She repeatedly pointed out Julian’s mistakes. While he was at the barre, she got down in front of him and repositioned his legs, shaping and pounding his thigh as if she were sculpturing clay. Her finger impressions were visible on his skin. Afterward she spoke warmly of Julian, saying that he had made significant progress, and that she had formed a real bond with him. “He may not understand Russian very well, but he understands me,” she said. In practice Ms. Arkhipova also sometimes grabs hold of Joy. Ilya Kuznetsov, a Bolshoi instructor, said the emphasis on rigorous practice and physical contact helps explain why dancers at the academy shine. He said that when he worked in California, it was all but taboo for teachers to touch ballet students. He said he was startled to learn that he needed a $2 million insurance policy there in case a parent sued him. The Russian children reacted with curiosity to Julian and Joy. Yuliya Artamonova, Joy’s best Russian friend, said the girls were impressed with — and perhaps a little jealous of — Joy’s talent. Yuliya speaks hardly any English, but Joy’s Russian has improved enough that they seem to communicate well. Still, as the school year is ending, Joy sometimes misses the nuances of instruction. At one practice Ms. Arkhipova criticized her for “twisting yourself up.” Joy later said she had not quite understood her, though she thought she had gotten the gist from Ms. Arkhipova’s tone and body movements. Julian said he also tried to intuit what his teachers are saying when he cannot grasp the words. Whether in Russia or the United States, dance terminology is generally in French, so both Joy and Julian already knew that. 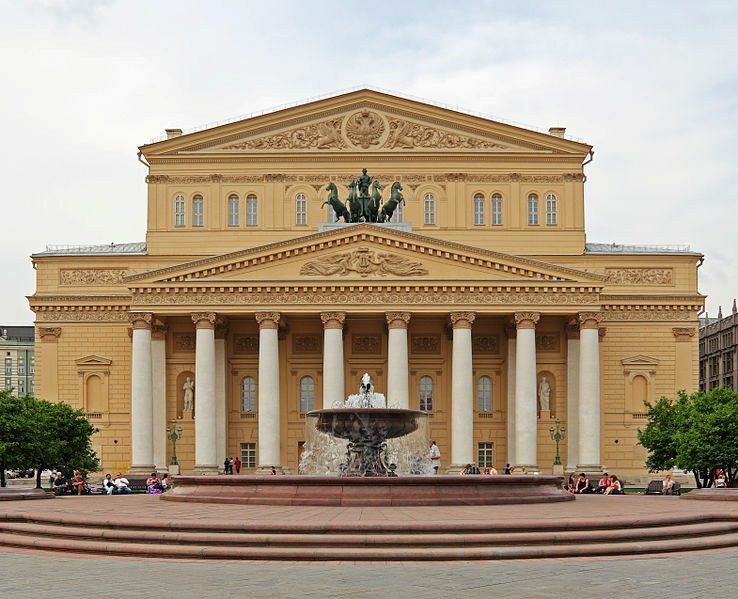 Bolshoi students spend three to eight hours a day rehearsing, six days a week, in addition to their academic classes. Foreigners receive Russian-language instruction. Julian lives in an apartment in Moscow with his mother. His brother, Nicholas, 9, has been accepted at the academy for the fall. The boys have two half-sisters who are professional dancers in Europe, though their mother, Teresa Khan MacKay, does not have a dance background. Julian’s father, a computer consultant, is in the United States, but travels here regularly. Joy, whose dark hair sets off her pale skin and almond eyes, has the maturity, not to mention the discipline, of someone far older. She moved to Russia on her own and lives in the dormitory with Russian and foreign students. On some days she does not leave the building. Growing up in Texas and California, Joy learned about Russian ballet from videos on the Internet. She so idolized Natalia Osipova, the Bolshoi star who is appearing with American Ballet Theater this season, that she burst into tears the first time she saw Ms. Osipova perform live. “I had never seen dancers like that,” she said. At first her large family — she has six brothers and two sisters — thought that her longing for Moscow was a teenager’s fantasy, but her parents allowed her to go. While she has never regretted it, she has had bouts of loneliness, especially during holidays like Thanksgiving. And the whole adventure nearly came crashing down over the winter. Joy was among a group of students selected to perform for a regular Bolshoi audience in a special gala, along with the stars of the Bolshoi Ballet itself. It was an honor. But on the big day she had excruciating pain in her foot. She could not imagine withdrawing, and there was no understudy. Her teachers applied cold to numb the throbbing, and somehow, she danced. She later learned that she needed surgery for a bone injury common to dancers. But she did not have the money for the fee. Her parents then told her they could also no longer afford her tuition. She would have to come home. “I was just desperate, absolutely desperate,” she said. The next day, at her English-language church in Moscow, where she goes regularly, a parishioner offered to pay for the surgery. Her parents — her mother is a doctor who is only now resuming her practice and her father works in the energy industry — later said they would scrape together the money so she could stay through June. She had the surgery and recovered in a month. Her teachers said Joy had so blossomed that she was being prepared for a major role in a Bolshoi production featuring teenagers. She said her goal is stay here long enough to graduate from the academy and become one of the few foreigners to join the Bolshoi company itself. Julian said he too felt a pull here. The first months were bewildering, he said, and he was grateful that his teachers did not give up on him. How many people know exactly what they want to with their lives at the age of 11? And how many people are willing to move halfway around the world, away from their families, to spend most of every day practicing something that requires intense concentration and discipline at an age when most kids are riding bikes and playing in the mud? That is one thing that makes Julian MacKay, an 11-year-old ballet dancer from Bozeman and the only boy from Montana ever chosen to attend Russia’s elite Bolshoi Academy of Ballet, so special. Theresa Khan MacKay, Julian’s mother, laughs and shakes her head. She and her husband Greg are the parents of four ballet dancers, including Julian and his 8-year-old brother Nicholas. Her two older daughters are professional dancers in Europe. But she was. So when Julian at age 6 started asking to dance, Theresa knew what to expect. Ballet was a serious sport, requiring an incredible amount of dedication and time. But after watching Julian “jump around in the yard and copy my sisters,” as he put it, and fielding more pleas, she relented. Julian began the six-day-a-week training regimen that would eventually land him auditions for the Paris Opera Ballet School, the Royal Ballet School in London, the “Billy Elliot” Broadway production and the Bolshoi Academy. Montana not being the heart of the ballet world, the MacKays knew they would eventually need to send Julian elsewhere to study. He has spent the majority of the past four summers and some of the year training in California, New York City and London. It was during a program this summer, an intensive six-week clinic by the Bolshoi Academy on the East Coast, that Julian was selected – after only three weeks – to attend the school in Moscow for a year. Rina Kirshner, vice president of the Russian American Foundation that sponsors the Bolshoi summer program, said Julian was the only American boy from the younger group of students to be chosen for the yearlong program. The Bolshoi program will be tough—in addition to six days a week of classes, students are also required to take a Russian language class, a ballet history class and a music class, plus their regular tutoring. Julian isn’t unfamiliar with hard work. His typical day begins at 8:30 a.m. with a one-and-a-half hour ballet lesson. A 30-minute break is followed by another lesson. His training also includes sit-ups, push-ups and swimming. His homeschooling is fit in around ballet whenever there’s time. For fun, Julian likes to play with his brother, compete in chess tournaments and occasionally fence with the Montana State University Fencing Club. “That’s pretty amazing for any boy — you get to play with swords!” he said. But, he casually admits, there isn’t time for much else besides ballet, and that’s OK with him. “My main focus is dance because I want to be a professional dancer,” Julian said. Before boarding the plane, the family will spend a few weeks in California for Julian to train and get in some much-needed kid time before beginning the rigorous yearlong program. “He’s a little kid, he needs to go surfing,” Theresa said, as Julian nodded vigorously. It’s a long way from San Bernardino to Moscow, but Matthew Leonardi, 14, is making the leap. In his tough San Bernardino neighborhood, Matthew Leonardi doesn’t talk much of his graceful pirouettes or evenings spent dancing with girls in pink tutus. He’s not ashamed; he just doesn’t need the grief. And the tights are completely off-limits. Matthew is no Superman, but he has accomplished a pretty super feat. He has been asked to attend the Bolshoi Ballet Academy in Moscow, a rare invitation from one of the best dance schools on Earth. According to the Russian American Foundation, which organizes auditions for the Bolshoi, Matthew Leonardi is the only American male accepted this year. The polite, good-natured boy with the wild head of hair and mouthful of braces has never left the country. He is supposed to arrive in Russia early next month. San Bernardino is known for many things — the birthplace of McDonald’s, the Hells Angels. Ballet isn’t one of them. Still, Cecilia Hering, Matthew’s dance teacher, said famed dancer Twyla Tharp once lived and trained in San Bernardino. 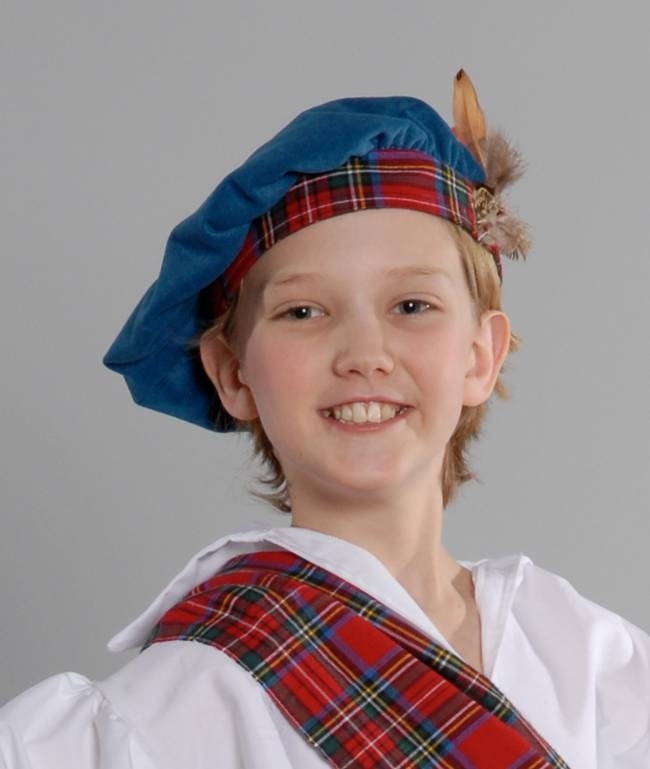 Ruddy-cheeked, with an easy smile, Matthew was noticed in August while participating in the Bolshoi academy’s Summer Intensive Program in Connecticut. Several top professors were impressed. The course in Moscow lasts about four years. It includes academics, and when he graduates, Matthew will receive something akin to a bachelor of fine arts degree, his mother said. Matthew seems somewhat overwhelmed by the prospect. Prior to this, he wasn’t even certain he wanted to be a professional dancer — maybe an architect or engineer. That’s all changed now. Matthew began dancing at age 4, when his sister’s ballet teacher asked him into the studio so he would stop crying in the hallway. He immediately began imitating the moves. A chronic ear infection rendered him partially deaf for years, and he didn’t start talking until he was almost 5. He danced before he could speak. In middle school, he played football and basketball and didn’t talk much about ballet. Other students teased him when they found out, he said. His mother recently transferred him to a Catholic school. One of Matthew’s ballet teachers was Spencer Gavin, a member of the State Street Ballet in Santa Barbara. He understood his pupil’s plight. When Gavin was in high school in Riverside, he, too, kept his ballet a secret. Matthew comes from an artistic family. His mother ran a puppet theater, his grandfather headed the music department at Northern Arizona University and his grandmother taught music at Phoenix College. The family’s San Bernardino home is in a neighborhood that’s seen its share of crime. Iron bars cover the windows and gang activity can be found close by. Matthew stood outside recently talking about a break-in and other incidents. “I saw a group of guys on the street once and one of them was holding a weapon,” he said, sounding both excited and frightened. His mother frowned. Despite financial challenges, the Leonardis have excelled in academics and sports. Matthew’s older brother attends Johns Hopkins University on a scholarship, and his 17-year-old sister hopes to get a scholarship to Princeton to study medicine. Valerie Leonardi works three jobs. She teaches kindergarten, teaches children too sick to attend class and runs an after-school program. Most evenings, Matthew trains at Hering’s School of International Ballet in Redlands, often arriving at 3 p.m. and staying until 8. Once inside, the limber teenager sheds any sense of self-consciousness and dances slowly, deliberately around the room. On a recent evening, Hering put him through his paces. He sweated as he kept up with the commands. “Nothing is more refined or defined as a ballet dancer,” Hering said approvingly. “Matthew has a natural ability for artistry. When he sees something he can imitate it,” Hering said. After class, she asked if he was ready for the challenge of the Bolshoi. “I heard they go easy on Americans,” he said.